Friday sees the last set of games with staggered start times & the finely poised Group C, it still looks to be wide open although Ukraine's excellent win over Sweden has put them in a good position. We're taking a look at both games including England's key fixture against Sweden as we try to find more great bets like last night's Andrea Pirlo to be man of the match! Co-host Ukraine entertain France at the Donbass Arena, Donetsk as they look to seal their place in the knockout rounds. After beating Sweden on Monday night with a headed double from national hero Andriy Shevchenko another victory against France will mean quarter final football & reward for their fanatical fans. Ukraine manager Oleg Blokhin is refusing to give any indication to what his starting line is going to be for the fixture. With the fact that France dominated possession & midfield against England we would expect Blokhin to sacrifice an attacker & bolster his midfield so they don't get overrun & can close up the available space for the likes of French duo Nasri & Ribery. France will be disappointed to only come away with a point against England with a defensive lapse at a set play costing them. Nasri scored the goal on the evening & he was a constant menace throughout, finding space between the midfield & back four so Bayern Munich's Anatolii Tymoschuk will have to be at the top of his game to negate his influence. Striker Karim Benzema looked sharp & had plenty of attempts, mainly from distance, against England & if the French midfield can find a cutting edge & provide him with the ball within the region of the penalty area then you would expect him to do the rest. Benzema will certainly have better support than Sweden provided to Ibrahimovic & that could prove the difference, if he doesn't score himself then we can see him laying the ball off to his supporting attackers to get strikes on goal & Ribery could be the man to benefit, he's available at 7/1 to score first & is a decent bet. Ukraine celebrated as if they'd won the tournament when the whistle blew against Sweden & that indicates the levels of expectation they truly have, it may be difficult for their players to raise their game again here & whilst the weakness in France's defence is certainly there it's probably been slightly overplayed by some of our 'expert' pundits. Get on France at odds of 11/10 to show why the money was flowing in for them & outright glory pre-tournament, they have enough classy operators & should improve with the outstanding young holding midfielder Yann M'Vila likely to come back into the starting lineup. The second match of the evening is between England and Sweden at the Olympic Stadium, Kiev as both sides look to pick up their first victories of the tournament. The teams seem to meet on a regular occurrence & they are usually tight affairs with four of their last six meetings ending level. The draw as an outcome wouldn't suit either side but would especially give Sweden a mountain to climb in their final group fixture. England seemed please with their performance & point against France but now the emphasis will be on them to pose a greater attacking threat which may be difficult. With Wayne Rooney still suspended we would expect Ashley Young to line-up behind Danny Welbeck again but thoughts could turn to Andy Carroll as Sweden conceded two headed goals against Ukraine. Sweden were disappointing against Ukraine in their opening game & surprisingly just sat back and opted to counter attack which was different to their attacking approach in qualifying. The defence looked vulnerable, especially against crosses, so a tactical switch is likely to take place with Jonas Olsson coming in at centre back & Andreas Granqvist moving to right-back. The likelihood is that Johan Elmander will come into side at the expense of the ineffective Markus Rosenberg & will hopefully give them more of an attacking edge & take some of the burden off of Zlatan Ibrahimovic. Ibrahimovic was a class above anyone else on the pitch against Ukraine in a deeper role & managed to slot away the opening goal with a cool finish. England will have to pay extra attention to him as he floats between the two banks of four, it's a real concern with midfield duo Scott Parker & Steven Gerrard suffering with fatigue (we suggested they may struggle for fitness after playing France) but having to start due to the other option in the middle being Jordan Henderson - we're not sure he'd look out of place in Ireland's midfield! We just can't see goals in the game, Hodgson has England set up a very particular way & they'll need an incisive finisher if they are to take the limited chances they'll create although it was a positive to see such a great delivery from a set piece for the goal in their opener. 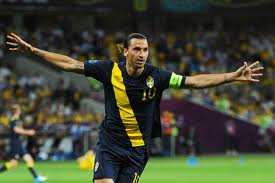 Sweden will always offer some danger with Ibrahimovic up front but England will know he's by far the biggest danger & look to frustrate & negate him at all times. Take the under 2.5 goals that is on offer at 7/10, either side could nick this but the draw seems a big player in the market.